Come on over and learn some new Valentine’s Day treats! If you’ve ever wanted to learn how to decorate cookies with fondant and Royal Icing, this is the time to learn. I’ll show you how easy and fun it is so you will have new ways to decorate your cookies! I’m sure you’ve seen the packages of colorful fondant here in Eminönü and perhaps wondered what to do with it. Here’s your chance. During the class, we will roll out cookie dough and fondant, bake cheesecake brownies and decorate the baked cookies. 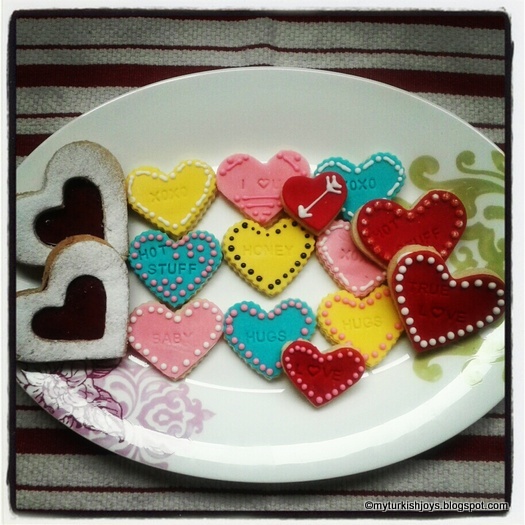 We will use cookie stamps to create our own conversation heart cookies like the ones I made in my photos here. You can personalize the cookies anyway you would like. These personalized cookies are perfect for kids or for a special sweetie! Each participant will take home a bag full of the treats that we will make during the class. The class usually lasts 3 hours and will be part hands-on and part demo in my kitchen here in Istanbul. Coffee, tea, soda and light snacks will be served. Monday, Feb. 11 @ 10:30 a.m.
Tuesday, Feb. 12 @ 10:30 a.m.
Tuesday, Feb. 12 @ 7-10 p.m. Please RSVP by e-mail to myturkishjoys@gmail.com with your phone number and which class date and time you are interested in. A plateful of gooey Cheesecake-Brownie Bites. The biscuits look divine. Wish I was a bit closer. i bet you will all have so much fun! @Joyce, I'd like to think so! Gotta shop for supplies this week. Looks like a SUPER class - always wanted to learn more about fondant. Would that I were closer!